Tampering with an odometer is a federal crime. The U.S. Department of Justice estimates odometer fraud costs consumers an average of $4,000 per car. Those estimates are figured by comparing the price paid for the tampered car against its actual value. 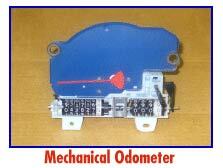 However, "clocking" or turning back the odometer is as prevalent as ever proving odometer fraud is very difficult. Despite the passage of state and federal laws against the practice, used-car odometers are being rolled back at the rate of about 450,000 a year, a government study has found. The National Highway Traffic Safety Administration estimated the rollbacks cost consumers more than $1 billion a year. A pre-purchase inspection by an ASE Master Technician and Frame Specialists can determine if the mileage on the odometer is consistent with the actual of wear and tear on the vehicle.